I see a significant intersection between my personal and professional interests and a career in finance, and as such, I saw the trip as an opportunity to see if the intersections are significant enough to make finance a career path for me. As such, it was with great excitement that I absorbed the words of one executive at Wall Street when he gave us his story. According to him, his success in the industry lies in his fascination and ability to identify companies like Starbucks that saw a genuine need (in the case of Starbucks, the need for good coffee) and went ahead to tackle such needs. This to him was the virtue of the capitalistic system. For a break, his story wasn’t that of pessimism about capitalism, rather, his message was of sincere passion and it mirrored some of my own drive. 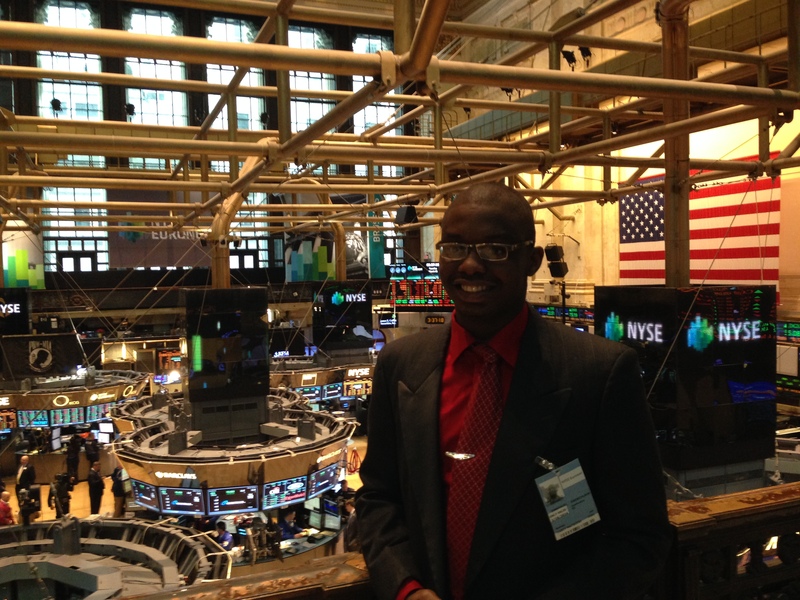 During the many tours, I got to learn about the scope of the financial industry. I also got to learn about some very financial aspects of working in the financial sector, and some not very financial ones. To explain what I mean by this: I got talks about how working in an investment bank varies from working in an asset management firm, and also the different departments one can make a home in these different financial firms. On the other hand, I also got to ask questions about how a newbie in the Finance industry from college in far away West Coast sorts out issues like: living accommodation; health and nutrition; transportation; and social and intellectual interest, in a strange and fast paced city like New York. To work in the New York financial sphere, my experience outside of work is just as important as my experience inside the work place. My experience on the above topics didn’t just end when I asked these questions. For a large part, I got a first hand glimpse of the answers to some of the questions on life in New York. Having never navigated the Subway or the Yellow New York City Cabs, the experience got so real, when we hurriedly made our way to the Subway dodging and bumping into human bodies that practically had the same aim as us: get a standing space in the next carriage or risk running late to your appointment! The city is indeed a fast-paced one. One of the highs of the trip was getting to explore this complex web of the financial industry alongside my peers from Reed. But on a distinct dimension, the fellowship really was an individual and intimate one. We were individuals with peculiar personalities, and backgrounds. Just like another executive in the industry told us regarding the hiring philosophy in his firm: “It is really about you, as an individual, and how the firm will help you fulfill your career ambitions.” Even if the mental picture the above phrase paints doesn’t reflect what many think about these corporations, it succeeded in accurately conveying the aim of the Reed Financial Fellowship. We were a group of sophomores and juniors, and our real interest wasn’t necessarily to get a job in the firms, we wanted to gain an in depth understanding of if and how we could fit and strive in the industry and making such a realization was a personal affair. In all, taking part in the Reed Financial Service trip was one of my best professional decisions. I can’t say that I conclusively answered all the questions I set out with, but I gained enough knowledge to start think of the next step in my many steps towards a career path. And the ability to make this realization is an opportunity any Reedie who is even slightly nursing the idea of a career in finance should not miss out on.